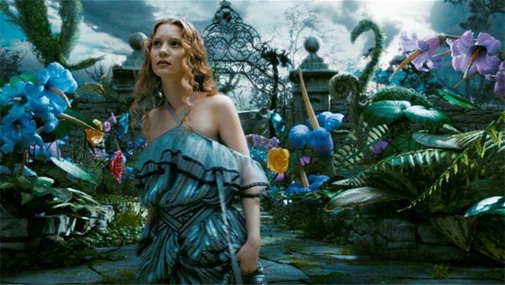 On Saturday I saw Tim Burton’s Alice in Wonderland, a film I’ve been excitedly anticipating for several months. I have to say I was both inspired and disappointed. The visuals are amazingly creepy, giving familiar characters the Tim Burton treatment. 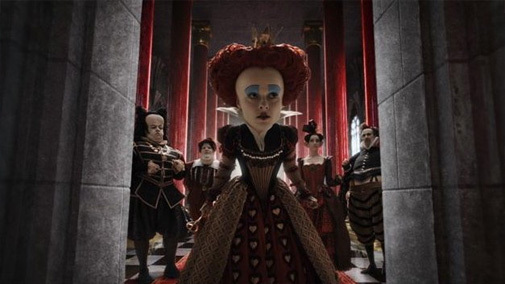 Helena Bonham Carter was splendid as an insecure, yet cruel Red Queen. Her performance and lispy, ‘w’ heavy speech were very reminiscent of her Morgan Le Fey in the TV miniseries Merlin. I was not as impressed with Johnny Depp, who usually can do no wrong. His Mad Hatter looked like a ginger mix between Madonna and Elijah Wood, and his crazy ranting bordered on irritating. I loved Mia Wasikowska as Alice and Stephen Fry’s Chesire Cat. However, it lost the smug, likable nature of the Caterpillar I loved so much. The visual brilliance of the film almost makes up for the lack of originality in plot. It reminded me very much of Prince Caspian, the most recent film from The Chronicles of Narnia series. Child(ren) grows up since her last visit to a magical world. She finally returns and that world is in trouble. An evil royal has taken control of the land and must be stopped, as foreseen by a prophesy. She defeats the enemy against all odds and restores peace and magic to the world. With all the amazing characters Burton had to work with, I expected a more creative storyline. However, as Lewis Caroll’s story is dear to my heart, I really did love Burton’s adaptation and reinvention. This entry was posted in film and tagged alice in wonderland, johnny depp. Bookmark the permalink.